Too Much Green in My Garden? “Your carrots look really good,” my mom said as she looked out my kitchen window. Ah yes, two lacy green rows of baby carrot tops all in a straight row – nice and thick. Today, I thinned my carrots, because I’ve learned that if they are too close together, there will be no room for the carrot to grow. Now maybe it’s the Bambi Syndrome, but I hate pulling up those tiny little carrots and discarding them! Murderer! It’s not their fault that I planted them so thick. While thinning them I need to make the decision as to which one stays and which one goes. It’s not always the biggest plants that stay. 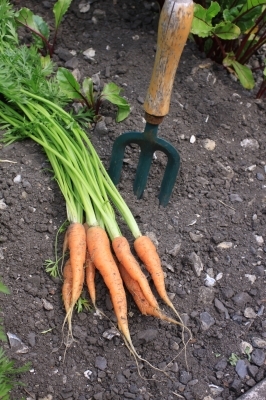 I just need to have a row of well-spaced carrot plants when I’m finished; so any plant that is too close to another, no matter how big, good, or healthy, has to go! I couldn’t help thinking that our lives are a lot like those rows of carrots. So many good things press into our schedules, often keeping us away from what is really important. As born-again believers, what is most important? Being a good worker, or being a godly worker? Raising good kids, or raising godly kids? Having a great marriage, or having a godly marriage? Good things make good kids. For example, dance lessons are a good thing; soccer is a good thing, Girl Scouts, Boy Scouts, 4-H, family reunions, camping, skating, working… these are all good things. They can build character into our children and can build strong families, but when anything gets in the way of godly “things” like church attendance, our personal or family devotions or prayer time, then that good thing must go. Our lives may look great – lots of green tops, but when the harvest time comes, will there be a carrot? Will there be any fruit for Jesus? Do I need to “pull out” some of the good things to make room for the godly things? Well, here’s the deal. I KNOW that I MUST pull those good carrots out to get fruit, so even though I hate doing it, I did it because I wanted the fruit at harvest time. The real question for you is, what kind of fruit do you want in your children’s lives and can you accomplish that with your present schedule? Too often we are fooled into thinking that we’ll get the desired result of godly children even though we don’t do what God requires. And, at the risk of being too harsh, the problem goes a bit deeper – as adults, our hearts are not really “panting” after God as the deer thirsts for water. Can we really drink of the Word without being under the preaching of the Word or without reading the Word? I love growing root plants. It’s so exciting to think about what’s happening under the ground! About six weeks from now, I’ll be out there brushing the dirt away from the tops of the carrots to see if there’s any orange coming! As we raise our children or walk our own path of sanctification, I think we should do the same check: brush away the “cover-ups” that we may create, the false impressions that we are giving, and take an honest hard look at what’s happening under the “dirt.” Man sees the outside, but God sees the heart. He knows what’s truly in the garden of our hearts and in the garden of our children’s hearts. When Judgment Day arrives, will any of us regret any decision we made to draw our families closer to God? I seriously doubt it! Wanda, I couldn’t agree with you more about prioritizing faith events over sports. Two of my teens have purposely chosen attending our church youth group over other things. My oldest teen is the only that has rejected faith (for now). I’m in good company, though, as our own pastor and his wife are still praying and waiting for their children to return to Christ. I can’t take any credit for my own salvation or for my children’s. But I will pray for all three of them as long as I have breath.